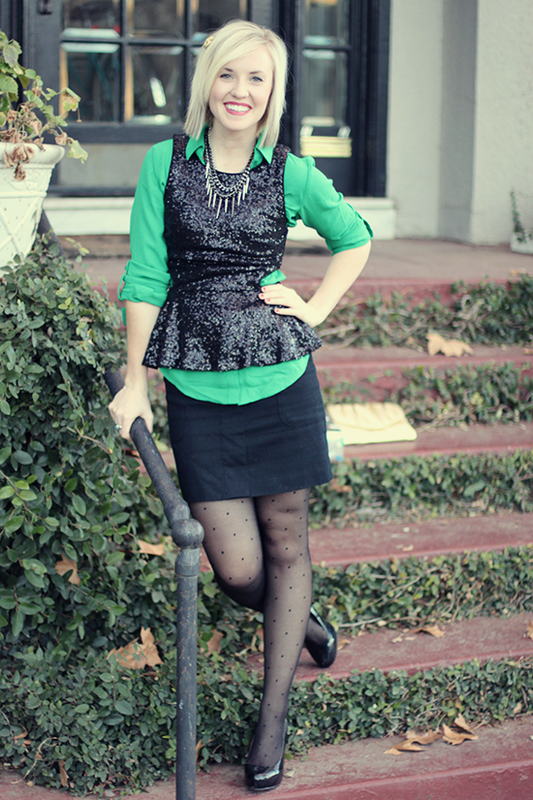 skirt: old navy // button up top: The Limited // peplum sequin top: Forever21 (sold out similar here) // Pumps: Aldo (old) // gold clutch: thrifted I pulled this sequin peplum out today and to my surprise discovered these scandalous cut out sides. I probably wouldn’t have ordered it knowing this, but it’s already in my closet and past it’s return policy. I suppose it works with a bright colored top underneath, next time I wear it I might try lace instead. I don’t generally wear red, so I’m celebrating with red’s younger brother emerald green. 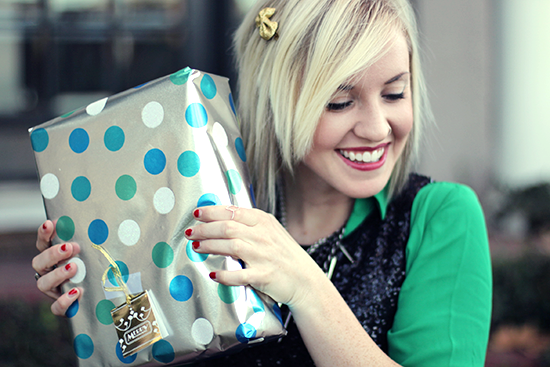 What I love about holiday fashion is you have so many beautiful and rich tones to play with. Anything from gold, silver, deep blues and greens to pinks and reds. Basically any color flies this time of year and I’m all about that. What colors are you drawn towards this time of year? Hope you all have a Merry Christmas! This is so cute!! And I’m in love with the necklace. That’s a great shade of green, though I typically go red. Merry Christmas!! Love this look! So festive and cute! Love this look! 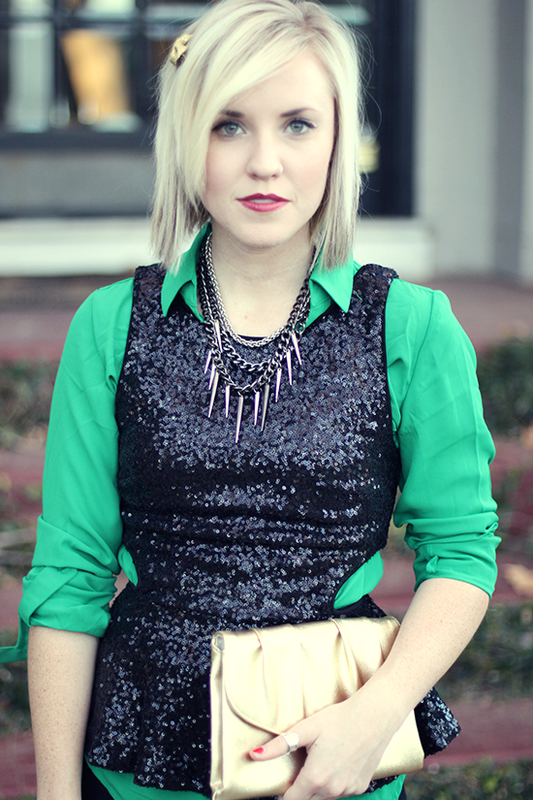 That sequin top with the green blouse really pops!! Hope you had an awesome Christmas! you look absolutely stunning! 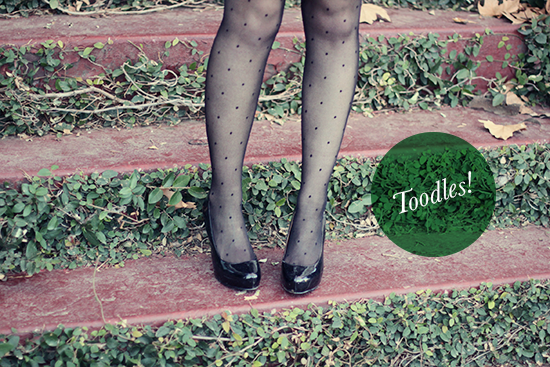 we love the mix of emerald green with the sequins and the dotted tights, tres chic!